In the midst of the absolute right-wing craziness of the last few months, it was nice today to realize that something historic has happened. A hard-working, working class woman with brown skin is now sitting on the Supreme Court of these United States. I think this crazy sideshow about birthers and town hall mobsters is to distract us all from realizing what Obama set in place with this brilliant nomination as well as his many other stunning nominations and reasonably well thought out policies. What a celebration this day should be for all of us. Those sad old white men fighting so hard during her confirmation hearings to run over her story, her story that is so uplifting and such a guiding light for all of us who are of color, for all of us who are women, for all of us who are working class. Boy this explains so much. They don't want us to talk about it, to appreciate the depth of change that Obama and his administration are both doing and highlighting that others are doing. They don't want us to have a conversation about how we might live more integrated, more sustainable, healthier, lighter on the land, and more outward- and forward- thinking. They don't want HOPE. Remember when, both before and after the election, we had hope. I experienced watching this country as watching a friend who was recently out of a bad marriage. There was a sense of coming out from being under a squashed thumb. We talked about things we hadn't talked about in a while. The national conversation was livelier, more hopeful even while it was focused on real things like the crumbling of the Wilkins Ice Shelf in Antarctica this last April or Michelle Obama's organic garden and the way she used it to talk to young people and their parents about the food they eat. The Republicans are trying to prevent a modern-day version of the New Deal. They don't want the Democrats to get the boost of goodwill that we should be earning and receiving. So they've been distracting us all. Man, maybe that's why they paid Sarah Palin to get out there - to distract us, to create one ruckus after another. To deal with Obama's fake birth certificates or some washed-up Bush appointee talk about why Bill Clinton shouldn't have gone to North Korea, on behalf of this government, and freed two young women. They don't want us to have that conversation, to celebrate and talk about what we are doing - in energy improvements, in local food, in running for office and working in government, in creating community. So, heh, let's just do it anyway - do what we do to make our world a better place, talk about that, and talk to people about how very cool it is that we have Obama in the White House, Hilary Clinton at Secretary of State, and Sonia Sotomayer as a Supreme Court Justice, among many others. This all came up for me, reading this lovely story in USA Today that Markos at Dailykos pointed us to about how Latinos in this country are celebrating wildly, now that we have a "wise Latina" on the court. First, what Kos said that nailed it: "And while we Latinos celebrate Associate Justice Sotomayor's accomplishments, we have also take note of who tried to stand in her way." "Hang in there and work hard"
In this city where United Farm Workers organizer Cesar Chavez once lived, migrant workers from Mexico have toiled for decades, and Hispanics make up 66% of the nearly 200,000 population. Here, Sotomayor's confirmation to the Supreme Court is more than just a call to celebrate Hispanic pride. It's a call to action. Oxnard, the largest city in Ventura County, north of Los Angeles, is an agricultural center also known within the relatively affluent county as a place struggling with poverty, gangs and school dropouts. "If there was ever a time to tell our kids to hang in there and work hard, this is it," said Carmen Ramirez, 60, a longtime community activist and attorney in Oxnard of Mexican descent. "Any person of color could look at her and say, 'I do have a future.' "
Oxnard attorney Barbara Macri-Ortiz, who is of Italian descent, married a man of Mexican descent and has two partly Mexican-American children. An education lawyer, she represents families whose children face expulsion. Now, she said, "we have an African-American president. 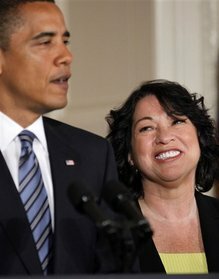 We have a Latina on the Supreme Court. We can say to our kids, 'No excuses. You can do great things, too.' "
It's a great article. Include it in your conversations about how this country is changing under the Obama administration and what we can all do to be a part of that change. This page contains a single entry by Lynn Allen published on August 8, 2009 4:01 PM. Frank Rich on the Brewhaha was the previous entry in this blog. On my Way to Netroots Nation is the next entry in this blog.